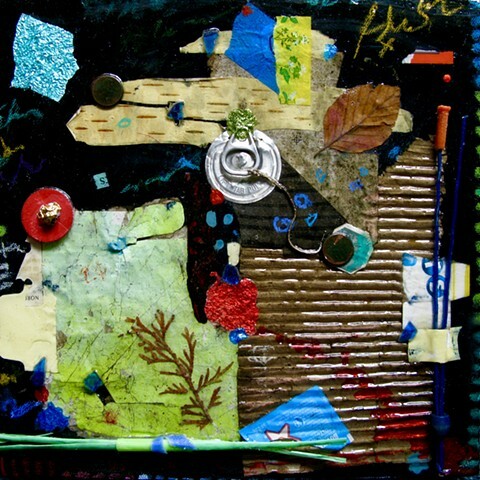 Collage: Plastic, Metal, Gesso, Chalk and Found Objects on Canvas, Cardboard, Plastic and Other. This piece was created using items I found during a walk in my neighborhood. I saw the two pennies first and then that lovely greenish/bluish/yellowish piece of cardboard. It was raining so the cardboard was soaking wet and filthy with mud. I had to wait for it to dry over a few days and then carefully brushed the dirt away because of its fragility. Everything I picked up was dirty and wet that day, and once everything was cleaned, dried, and laid out I decided to make it appear that it was still laying out in the rain. I poured a thick layer of Golden self-leveling gel over it and let it dry. Items used: Acrylic paint, cardboard, various paper bits, leaves, plastic bits, foil, metal pull tab lid, pennies, glass bits, a straw, wooden bead, pastel, nail polish, tape, self-leveling gel. I also love creating textural items from found objects. This is one of them.